A Blu-ray folder usually contains 2 separate folders: BDMV and CERTIFICATE folders. The BDMV folder under root directory of a Blu-ray contains information about the contents of the Blu-ray disc. If you want to play BDMV folders on PC, you should keep a few things in mind to avoid any problem in playing them. First, BDMV folder is not the Blu-ray first-level directory, that is to say, if you want to play a Blu-ray movie on PC like on an electronic Blu-ray player, you will need to select the Blu-ray folder as a whole, instead of any stream file. Second, Blu-ray is a patented technology with copyrighted protection, so is a BDMV folder. You will need authorized media player with appropriate license to play this format. Most regular media players are not capable to play such high quality videos and formats with layers of Blu-ray protection. 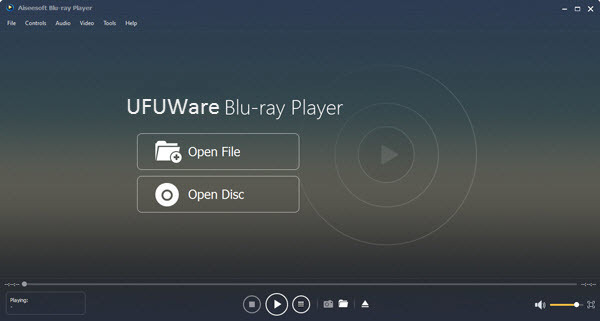 UFUWare Blu-ray Player Software is a piece of professional Blu-ray player software officially authorized by BDA(Blu-ray Disc Association). It support all Blu-ray forms, such as disc, folder and ISO files, and delivers high-quality picture and sound. Free download UFUWare Blu-ray Player and try below ways to play your BDMV folder. Open File: Click “Open File” button in the main interface to load the video to the program. Open Disc: To load Blu-ray disc, you can click “Open Disc” button in the main interface to select Blu-ray drive and then click “OK” button to load the Blu-ray directly. To load Blu-ray/BDMV folder, you can click “Open Disc” button to directly select the Blu-ray/BDMV folder and click “OK” button. Tips: 1. This program provides two methods to load the Blu-ray disc or media file: You can load the Blu-ray disc or media file through the corresponding button; also you can click “File” column to choose corresponding loading mode. 2. When you want to play the Blu-ray ISO image file, you need to load Blu-ray ISO image file to the virtual drive firstly, the open method is the same with loading Blu-ray disc. After loading Blu-ray disc, Blu-ray iso image file or Blu-ray BDMV folder, you will see a menu list containing Play Movie, Chapter, Audio, Subtitle and Other Titles. For Blu-ray: you can choose “Play Movie” to directly play the main movie. Or you can choose the other options according to your requirement. While the video is playing, click the “Snapshot” button to take a picture from a video. Click Open Snapshot Folder to find the captured picture. You can choose the snapshot format and the snapshot folder in the Preference window. And also you can choose the image format like JPEG, PNG, BMP. When playing Blu-ray disc, you are allowed to choose the specific title/chapter in the “Controls > Title/Chapter” column to play. How to Recover Deleted or Lost data from LG Fortune?